Thus begins the first part of my journal about my trip to the US. It’s not necessarily in order, but I am sure that this is what you guys want to read about in the first place. 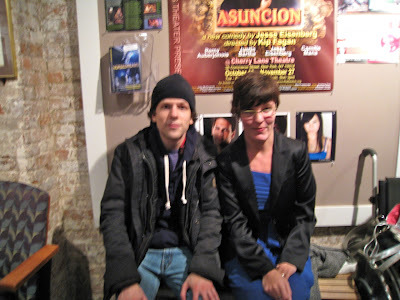 When I went on a trip to New York I had planned to see Jesse Eisenberg's play Asuncion in Cherry Lane Theatre. I really wanted to see the play, but I also really wanted to get my art that I did of Jesse and Justin signed while I was there, because why not, right? Anyway, before my trip I had contacted Cherry Lane Theatre and even though they couldn’t make any promises, they said that there was a good chance of getting my art signed. Going down to NYC from Boston was a fairly long but good trip. There was a lot of traffic so we got to the hotel pretty late and after unnecessary trouble with parking, they let us up to our room that was supposed to have an accessible shower (I'm in a wheelchair). It didn’t though. So about half an hour later we finally had the room we were supposed to have. I showered and put on a new dress that I had bought for the occasion and got dolled up because I never had reason to and this was as good as any. Took forever to hail a taxi and then the driver didn’t know how to get to Cherry Lane. Just my luck. Got there just in time though and my friend Jonathan from Cherry Lane helped me up to the front row. It's really fun being in the front row of a tiny theatre because it feels like you're right there up with the actors. Especially since the play was set entirely in a livingroom. Pretty awesome! The play ended and I got to wait inside of the theatre instead of out in the cold like everyone else. Justin Long had attended and watched the play and was waiting in the lobby with me, but because he wasn’t working I didn’t want to bother him. Cute though. I went to the bathroom but when I was just about in there I heard Jesse’s voice so I went back out. He and Anna (his girlfriend) were talking to friends though so I waited. My friend Mary eventually brought him over to me. It was perhaps the most awkward meeting I have ever had with a celebrity. We talked for a bit and then I asked him to sign some art. Took my artbook out and the first thing he said was “I know him, that’s Joe!” when he saw my painting of Joe Mazzello. It made me smile. Then he seemed to realize that I painted all that and told me it was amazing and that I was very talented. I thanked him a lot and talked about oneupme as he wrote in my book. Anyway, I thanked him again and he went back to his friends. Justin Bartha was still there luckily so I went up to him and asked him to sign his portrait. He said hello and hugged me and gave me a kiss on the cheek. Aw. He seemed genuinely impressed with my artbook and asked if he could look at the rest. He took his time and asked me where I was from so I told him I was from the Netherlands and he seemed impressed with that too, haha. I waited around for a bit and then took a picture with Jesse. Getting my art signed was a dream come true, because it's such an honour to have them see it in the first place. And a little bizarre. But it's good if you remember that actors are just people and that it's just as awkward for them"